You are here: Home » MEDIA » Books » A Brief Guide TO C.S. 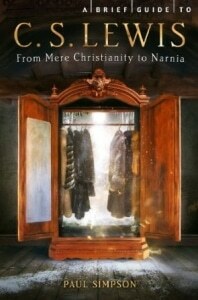 Lewis: From Mere Christianity To Narnia by Paul Simpson (book review). A Brief Guide TO C.S. Lewis: From Mere Christianity To Narnia by Paul Simpson (book review). Y’know, it’s rather weird. By now, we should have had the fourth Narnia film, ‘The Silver Chair’, but nothing is coming out of the wastelands, mostly as pointed out in the book that the contract option lapsed although there is a hint of ‘The Magician’s Nephew’ in the works. It isn’t as though these two or indeed, ‘The Horse And His Boy’ and ‘The Last Battle’ wouldn’t make interesting films, it’s more the stumbling block of finance and prolonged interest that would enable them to be made. I suspect also, unlike other fantasy series out there made into films, not having the same human characters throughout has been seen as part of the problem. Anyway, in the meantime, we have the extended titled ‘A Brief Guide TO C.S. Lewis: From Mere Christianity To Narnia’ by Paul Simpson where you can examine its writer’s history and that of his books in a concise volume. Lewis never liked his given names of Clive Staples and at the age of four declared he would be called ‘Jack’. Then again, he used a couple pen-names over his life-time which tends to suggest some dissatisfaction in his name that the book doesn’t go into. Then again, as he became an Oxford don, maybe there was an awareness of keeping different names for different work for a time. Something I didn’t realise before was that I actually shared a book interest of Lewis. Simpson points out that Lewis was largely influenced by HMA Guerber’s ‘Myths Of The Norsemen’. I discovered it and other of Gueber’s mythology books at the library when young, too, and fortunate to buy my own set of them a decade ago because of their clarity of writing on the subject. If you get a chance to read them, please do. Modern recounts of old mythologies have to rely on earlier books like Gueber’s so why not read the ones they sourced. It’s often said some writers recycle their old ideas as they find better ways to use them and Lewis is amongst these as his early stories had talking animals, a green lady and wastelands. Anything sound familiar? As he also took care of children during the World War 2 blitz and had a large wardrobe, the use of these isn’t too big a jump neither. Lewis’ fluctuating interest in religion before becoming a firm belief as adult and clearly had an influence on the Narnia books. If anything, considering his dalliance with Norse mythology that he never incorporated it into his books, although thinking logistically, maybe the witch is actually Hel, the Queen of the Norse underworld, although that isn’t analysed in this book and my own observation. For those who don’t know, Lewis also wrote three SF novels before Narnia. I read them when young, too. You can see the HG Wells influence and although its written here that he read and didn’t like David Lindsay’s 1920 novel ‘A Voyage To Arcturus’, I can see some of its influence there as well. Simpson examines Lewis’ other books which are mostly non-fiction, religious studies and how he dealt with the death of his wife. It’s also interesting to discover snippets of information about earlier drafts of the Narnia books and what was taken out to make them what they are. These were also written over a short period of time. Simpson doesn’t note that the two year gap between being written and in print would have to account for some of the time given for artist Pauline Baynes to complete her art. As most of you will be familiar with the Narnia tales, most attention is given to them. For the book, Simpson wisely covers them in their chronological order. Amongst the information given is the alternative titles they might have had and some adjustments made for the early American versions although apparently now, you people across the pond have now seen the British version. The one omission in the story synopsises is in ‘The Voyage Of The Dawn Treader’ where Simpson doesn’t reveal that the dying dragon Eustace discovers is the missing Lord Octesian but that’s a minor blemish when so much else is covered. I’m beginning to think I’m one of the few people who can remember the first TV 1967 version of ‘The Lion, The Witch And The Wardrobe’ on TV and it’s a shame that only two episodes only exist now as it would have been an interesting comparison showing how effective it was on us youngsters then compared to how special effects enhanced it 40 years later. It would be nice for some enterprising DVD company to release them if only for reference material for people like me. What is more remarkable is the number and various theatre productions and how the various stagings had to get around on budget and cast numbers. If you’re a fan of CS Lewis’ Narnia books, then this book will give you a needed insight into the man, his faith and other works. As seen from my comments, there’s certainly enough here to make you think. « A Companion To Science Fiction edited by David Seed (book review).